For societies with writing systems, hereditary leadership is documented as one of the hallmarks of early political complexity and governance. In contrast, it is unknown whether hereditary succession played a role in the early formation of prehistoric complex societies that lacked writing. Here we use an archaeogenomic approach to identify an elite matriline that persisted between 800 and 1130 CE in Chaco Canyon, the centre of an expansive prehistoric complex society in the Southwestern United States. We show that nine individuals buried in an elite crypt at Pueblo Bonito, the largest structure in the canyon, have identical mitochondrial genomes. Analyses of nuclear genome data from six samples with the highest DNA preservation demonstrate mother–daughter and grandmother–grandson relationships, evidence for a multigenerational matrilineal descent group. Together, these results demonstrate the persistence of an elite matriline in Chaco for ∼330 years. In ancient cultures without a writing system, it is difficult to infer the basis of status and rank. 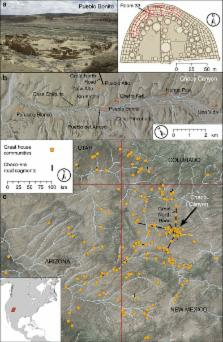 Here the authors analyse ancient DNA from nine presumed elite individuals buried successively over a 300-year period at Chaco Canyon, and show evidence of matrilineal relationships. MAFFT: a novel method for rapid multiple sequence alignment based on fast Fourier transform. A multiple sequence alignment program, MAFFT, has been developed. The CPU time is drastically reduced as compared with existing methods. MAFFT includes two novel techniques. (i) Homo logous regions are rapidly identified by the fast Fourier transform (FFT), in which an amino acid sequence is converted to a sequence composed of volume and polarity values of each amino acid residue. (ii) We propose a simplified scoring system that performs well for reducing CPU time and increasing the accuracy of alignments even for sequences having large insertions or extensions as well as distantly related sequences of similar length. Two different heuristics, the progressive method (FFT-NS-2) and the iterative refinement method (FFT-NS-i), are implemented in MAFFT. The performances of FFT-NS-2 and FFT-NS-i were compared with other methods by computer simulations and benchmark tests; the CPU time of FFT-NS-2 is drastically reduced as compared with CLUSTALW with comparable accuracy. FFT-NS-i is over 100 times faster than T-COFFEE, when the number of input sequences exceeds 60, without sacrificing the accuracy. The complexity of antisense transcription revealed by the study of developing male germ cells. Structural and functional characterization of recombinant matrilin-3 A-domain and implications for human genetic bone diseases. Kinetics of glucocorticoid receptor phosphorylation in intact cells. Evidence for hormone-induced hyperphosphorylation after activation and recycling of hyperphosphorylated receptors.